Colleges and universities across the U.S. experienced an increase in student activism over the past year, as students protested rising college costs and hostile racial climates on their campuses. Now, findings from UCLAs annual CIRP Freshman Survey suggest that participation in demonstrations may intensify in the months ahead. The survey of 141,189 full-time, first-year students from around the U.S. found that interest in political and civic engagement has reached the highest levels since the study began 50 years ago. 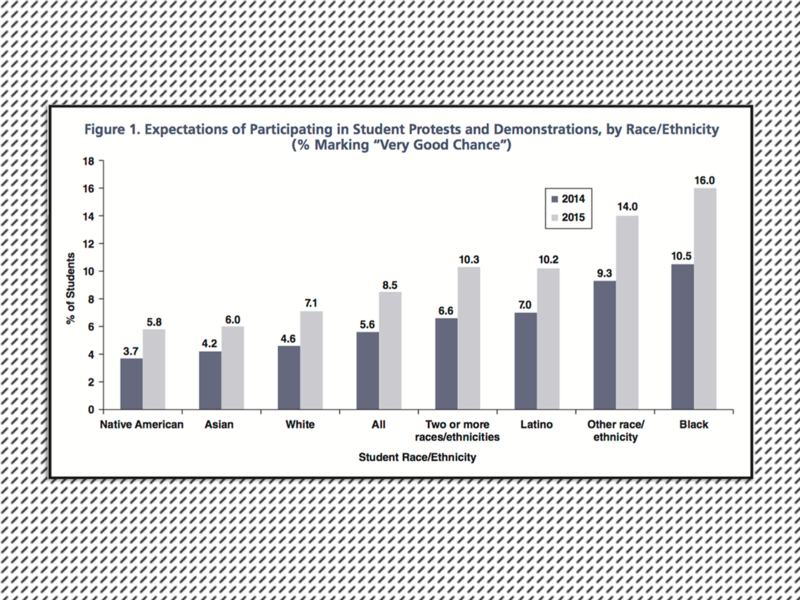 Nearly 1 in 10 incoming first-year students expects to participate in student protests while in college. The survey, part of the Cooperative Institutional Research Program, is administered nationally by the Higher Education Research Institute at the UCLA Graduate School of Education and Information Studies. The 8.5 percent who said they have a very good chance of participating in student protests while in college represents the highest mark in the surveys history and is an increase of 2.9 percentage points over the 2014 survey. Black students were the most likely to expect to protest, with 16 percent reporting that they had a very good chance of demonstrating for a cause while in college, 5.5 percentage points higher than in 2014. The rising interest in activism coincides with some recent successful protests by college students. After months of protesting a perceived lack of responsiveness by university administrators to racial bias and discrimination, University of Missouri students forced the resignation of the system’s president in November 2015. Further demonstrating students’ interest in community engagement, 39.8 percent of incoming freshmen said they want to become community leaders, while 60 percent expressed strong interest in improving their understanding of other countries and cultures – in both cases, the highest figures ever for those survey questions. In addition, 22.3 percent of students hope to influence the political structure and 41.2 percent say that helping to promote racial understanding is either an “essential” or “very important” personal goal. In the 2015 survey, 59.8 percent of incoming freshmen said they believed they have a “very good chance” of voting in a local, state or federal election at any point during their college career. That was up from 50.3 percent of the freshmen in the 2014 research. “If this broader commitment to community and political engagement manifests into action, particularly over the next year, college students have the potential to play a critical role in upcoming elections,” Eagan said. The rise in student activism has occurred as students’ political views shift farther toward the left. The survey found that 33.5 percent of incoming freshmen at four-year institutions identified as either “liberal” or “far left,” the highest proportion since 1973, when 36.4 percent of students were on that side of the political spectrum. Meanwhile, 21.6 percent of respondents rated their political orientation as either “conservative” or “far right,” down from 25.6 percent in 2006. The shift in political orientation corresponds with changes in students’ views on several hot-button issues. More than half of students, 52.3 percent, said the college admissions process should afford preferential treatment to people from disadvantaged social backgrounds – up 10.4 percentage points from the 2012 survey. Additionally, 56.4 percent support the legalization of marijuana, and 63.6 percent believe abortion should remain legal. 54.7 percent of Pell Grant recipients took out loans, compared with just 39.1 percent of other students. 72.7 percent of students without Pell Grant- students who tend to come from more affluent families – relied on family resources to pay for their first-year expenses, compared with just 32 percent of Pell Grant recipients. 84.1 percent of Pell Grant recipients expressed concerns about their ability to pay for college compared to just 56.7 percent of students not receiving Pell Grants. 28.5 percen- more than double the proportion in the 2005 survey – applied to at least seven colleges. The 2015 study incorporated responses from first-time, full-time students beginning their studies at 199 four-year U.S. colleges and universities of varying levels of selectivity and type. The data was statistically weighted to reflect the approximately 1.5 million first-time, full-time students entering 1,574 four-year colleges and universities across the country in 2015. Since the study was first conducted in 1966, more than 15 million students at 1,900 colleges and universities have completed CIRP surveys. The CIRP Freshman Survey is the largest and longest-running survey of American college students. To view a summary or obtain a copy of the monograph, “The American Freshman: National Norms Fall 2015” (K. Eagan, E.B. Stolzenberg, A.K. Bates, M.C. Aragon, M.R. Suchard, C. Rios-Aguilar) visit www.heri.ucla.edu.